Easter launch planned for light rail between Gungahlin and the City. File photo. The ACT Government has begun planning an Easter start to light rail between Gungahlin and the City, with a community launch and free travel planned for Saturday 20 April. But poor weather and the need for accreditation to be completed could still delay the launch. Minister for Transport Meegan Fitzharris said that Canberra Metro had advised the Government that it expected light rail to be operational by this date, but timing was still dependent on Canberra Metro meeting all third-party rail accreditation requirements from the Office of the National Rail Safety Regulator, Utilities Technical Regulator and the Independent Certifier. Ms Fitzharris said confirming a start date was important, but the priority would be to maintain a safe worksite and deliver a quality light rail system. “It is clear to everyone that significant progress has been made on the project, and we are now in the final stages of testing,” she said. “As with any complex infrastructure project, there are risks that can affect timing such as weather, the testing and commissioning of rail and signalling systems, and third-party accreditations. Ms Fitzharris said the Government would need to be flexible if there were issues that pushed back the start date, and it was working on those contingencies. “This is a really exciting time for our city, and I look forward to updating the community in coming days about how people can be among the first to ride light rail in Canberra and the events we have planned to launch our city’s biggest ever infrastructure project,” she said. Light rail Stage 1 had been due to be completed by Christmas but construction delays and accreditation requirements have pushed the launch date back. Ms Fitzharris has consistently refused to give a starting date, and recently the Government had to fend off criticism that it had known last year that the project would not finish on time. 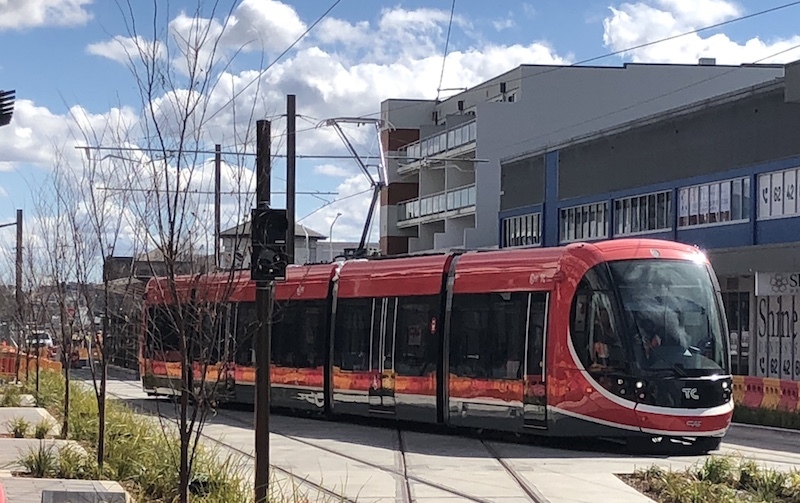 The launch of light rail 1 will come a week before the start of the new bus network on 29 April, to create an integrated transport system for the ACT. Will the celebrity on the maiden voyage be Gallagher?? Easter Saturday. When all of Canberra is at the coast. The real test will come a week or so later when all those flex and leave days expire and everybody is back at work. Just a mini birthday celebration for me then! Looking forward to see emptish trams after the first week. Ah good, plenty of time to run down pedestrians and run red lights before the statistics period begins. Bids for first ticket with proceeds to charity??? Are you saying that the trams, just like Jesus, might show up 3 days later ?